We are passionate about fresh, responsibly grown food. 1965 - John strohauer watching over a centrifugal-force machine that separates wet sugar from molasses in the sugar beet factory. 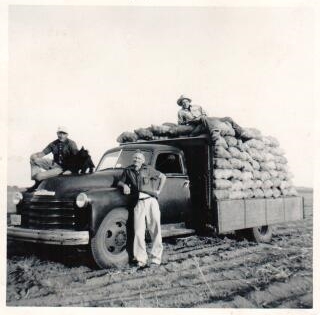 The Strohauer family began the farm in 1910 in East Greeley, Colorado. Originally from Germany, John Strohauer moved out West from Ellis Island to become a farmer. While living in Greeley, he also helped build the Weld County Court House and the Great Western Sugar Company factory. John's son, Harry P., started farming with his dad in the 1930s. He had volunteered to serve in WWII but was asked to stay and farm for the country. Harry P. was one of 10 siblings! His brothers John and Paul were also partners at times on the farm. Harry P.'s son, Harry D., currently manages the farming operation today in La Salle, Colorado. His wife and two of his three children are a part of the operation as well.